Water, is not the enemy! For so long we have been taught that water is the culprit of dryness when it is the exact opposite. Water is in fact the ultimate moisturizer. Using water and water based products will play a key role in keeping your hair hydrated. If you have been shying away from water, try incorporating it in your routine by lightly misting your hair (not saturating) and sealing the moisture in with your favorite moisturizing products. You will notice more elasticity and coils with more definition. A regimen lacking in the water department is bound to result in some dried out, crispy strands. An effective way to keep moisture in your hair is by using the L.O.C Method (liquid, oil, and cream). Use water or a water based product, oil to seal the liquid in, and then a cream to seal the underlying layers. Dark and Lovely Au Naturale has a whole product line called Moisture L.O.C ,perfect for using this method. 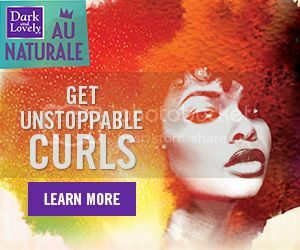 All the products under Au Naturale Moisture L.O.C. Collection are designed to work together for ultimate moisture during styling and retaining that moisture in the days after. The collection includes: Shampoil, Deep Conditioning Delight, Super Quench Leave In Spray (the liquid), Soak It Up Oil Cocktail and Lock It In Sealing Cream. Everything is formulated with Coconut and Moringa oils for a penetrating, super hydrating, uber soft finish that lasts for 7 days. How often a naturalista washes their hair varies from person to person. Oftentimes, these factors will determine the best wash schedule for you: the type of styles you like to wear, the length of your hair, how much product you use, and how active you are. One thing is for sure, if you have tons of product buildup on your hair, this will result in your hair becoming dry. If you have been loading hair with product all week long , it ends up forming a barrier that will prevent moisture from being absorbed. So for those who have been feeling like your hair is dry no matter how much product you put on it, this is most likely the reason why. Almost all of us have experienced super dry hair after washing, which is why many have come to believe that water is the source of dryness. Unless you have hard water issues (this can be solved by using a water filter), the source of the issue is the products that you are using to shampoo your hair. Shampoos are effective at removing dirt, oil and buildup. The problem is that along withremoving the stuff we do not want, it also strips our hair of the natural oils we need. Which is why you will want to go for a shampoo formula that does not contain sulfates and is a gentle formula. Make sure when you shampoo that you apply most of the product to your scalp rather than your hair. This will help avoid dryness as well. Co-washing or cleansing your hair with conditioner only, significantly cuts down on dryness. If you find that you like co-washing, you just have to keep in mind every once in a while, you will have to shampoo and you can acquire buildup if you don’t. For example, if you wash your hair once per week or four times per month, a good option would be to co-wash three times out of the month and shampoo once. In addition to improving your hair’s moisture retention, deep conditioning will make your hair more soft and manageable. Even if you co-wash, it is important to still deep condition your hair for strengthening purposes, as a regular rinse-out conditioner is not equipped to do this. How do you keep moisture in your hair and avoid dryness woes?